This scarf is cast on length wise and ribbed through lengthwise garter and stockinette rows. The hood is continued in stockinette stitch and closed using a three needle bind-off. Gauge: 4x4 inches : 11 stitches x 18 rows in stockinette stitch. Needle: 10.5 circular at least 24” long. Finished garment size: 72” long scarf. Using the long tail cast on (about a 12 foot tail), cast on 188 stitches. Repeat these four rows 8 times. Row 38: Loosely bind off 60 stitches knit wise. Knit to end. Row 39: Loosely bind off 60 stitches purlwise. (68 stitches for hood remain). Purl to end. Row 40: Slip first stitch knit wise, knit to end. Row 41: Slip first stitch purl wise, purl to end. Repeat these two rows 17 times. Finishing off: Spread stitches evenly among both ends of the circular needle; turn right sides together. Using a third needle, bind off loosely in knit stitch. Weave in all ends. Fringe: Cut 10 inch pieces of yarn for fringe ends. Gather 5 pieces together, fold in half and push loop end through row ends of scarf. Pull cut ends through loop and tighten. Tassel: Cut 10 inch pieces of yarn. Push through point end of hood on right side or use a needle to thread through end. Even out cut ends. 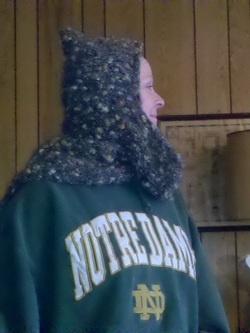 With a needle and a 20 inch piece of yarn, tightly wrap yarn 10 times around bunch about 1” from the point of hood. Push needle through center of wrapped yarn several times and then toward the tassel ends. Cut tassel even. This cowl is a simple garter stitch rectangle sewn into a circle. 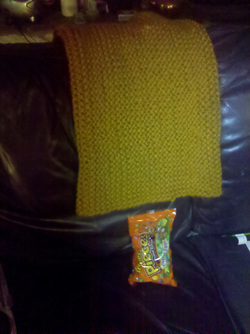 It is large enough to use as a snood (hooded scarf) and to pull down over the shoulders as a small poncho. Needle: 15, 17, or 19 depending on what bulkiness is desired. (Pictured garment used 15, larger sizes will be flufier and bulkier). Yarn: super bulky yarn like Lion Brand Thick & Quick (2.25 skeins or 240 yards). Finished garment size: 24” long, 36” around, unstretched. Using the long tail cast on, cast on 46 stitches. Work garter stitch (skip first stitch knitwise each row) until at least 60 garter ridges have been made. (120 rows). Bind off loosely. Stitch up cast on and cast of ends using a blanket stitch. Block.